(Seaside, Oregon) – Have you ever looked around the north Oregon coast town of Seaside and wondered: what on Earth is beneath you? What is under all that sand? 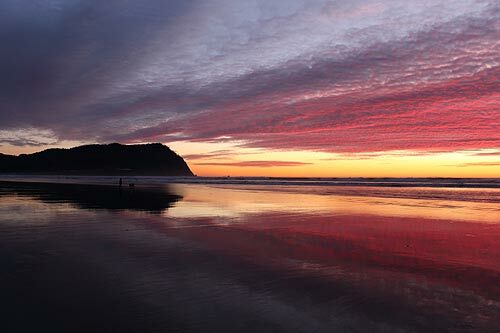 The answer is a little mind-boggling, especially when compared to other beaches along the Oregon coast. There’s a lot. All that sand goes really, really deep before there’s anything solid. Tom Horning, the famed geologist every coastal tourism official loves to have around, provided the trippy answer. There’s about 150 feet of sand before you get to solid Earth. Contrast that with Cannon Beach, Horning said, where the sand is only about three feet above the hard rock surface. Other spots around the Oregon coast can show their bedrock fairly often – albeit briefly – when winter storms scour out sand levels. They pop up at Newport, Pacific City and even parts of Lincoln City at times. At Seaside, however, you’ll never get to see bedrock. 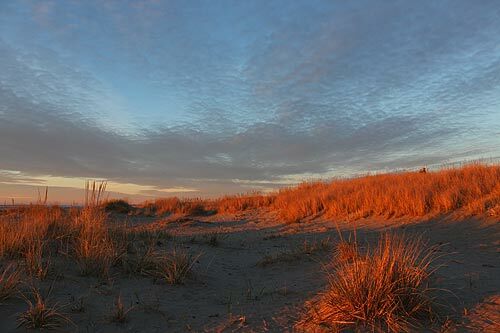 Horning said there are dunes rising up just above sea level. After that things get really down and dirty. Literally. 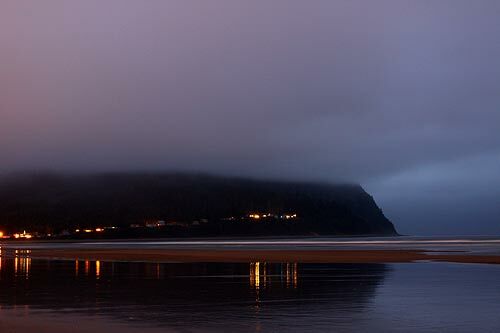 If you want to see what Seaside looks like underneath, head to Cannon Beach. He pointed to bedrock and cliffs with layers stretching across that tell all sorts of geologic tales, even providing this picture. The end of the Ice Age meant a huge rise in sea levels around here, where the beaches were probably a few miles west from where they are now. Then, somewhere after 10,000 years ago, the ice melted and the seas rose, swallowing up old formations and random stuff they left behind, like gravel from creeks. Horning provided a graphic spotlighting the Gearhart area, but it’s largely the same as Seaside. In it, you see layers of plants, fossils and crumbled bits of basalt. 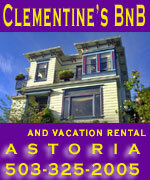 The Astoria Formation is like the ground floor of most Oregon coast beaches. Not like most of the headlands such as Tillamook Head or Neahkahnie, which are made of basalt (former lava flows), the Astoria Formation is softer. Sometime around 18 million years ago or so, a massive area along what would eventually become the northwest United States had already been carved out by various kinds of erosion. About then, it started filling back up with other rock debris, primarily sandstone and similar materials. 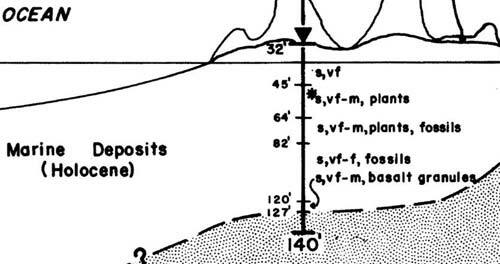 It was all underwater or around the tideline, and it formed a layer of sandstone and mudstone that was eventually named the Astoria Formation, running from the central Oregon coast up to the north coast. It's part of a massive underlying structure. This is softer stuff and gray, not black like basalt. It was actually a kind of fill-in mish mash of a variety of materials, much of it coming from eroded basalt from around Oregon, including the Gorge and other sources. That’s what you’re walking when you see bedrock during the winter at Hug Point or Arch Cape. It’s the same stuff lying 150 feet below Seaside.